"That's impossible," said twins Jeremy & Liza after their Mom told them they're all connected by this thing called an "Invisible String." "What kind of string?" they asked with a puzzled look to which Mom replied, "An Invisible String made of love." That's where the story begins. A story that teaches of the tie that really binds. Moms (and Pops) feel the tug whenever kids give it; and kids feel the tug that comes back: the Invisible String reaches from heart to heart. Does everybody have an Invisible String? How far does it reach, anyway? Whether it's a loved one far away, a loved one in heaven, or a parent in the next room, this delightful book illustrates a new way to ease a child's fear of loneliness and separation. 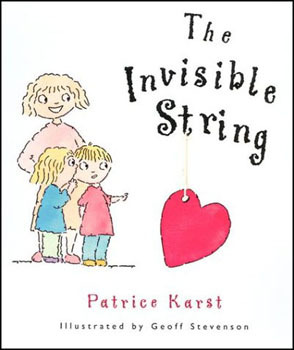 The Invisible String is a very simple approach to overcoming the fear of loneliness or separation from parents, with an imaginative flair that children can easily identify with and remember. Here is a warm and delightful lesson teaching young and old that we aren't ever really alone. It's a story no one has ever told or heard before. Not surprisingly, it comes from Patrice Karst, who's popular God Made Easy helped thousands learn whose string it really is!